This very unique and colorful teapot comes with 2 cups. 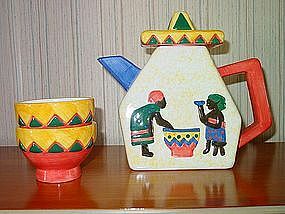 The teapot is white speckled with yellow and adorn with a vivid and bright reddish orange, green and blue. This was purchased in New Mexico. From what we can tell is one of a kind so I do not know the age of this set. 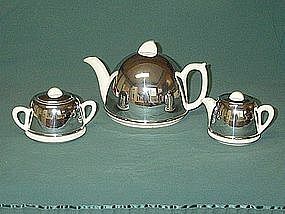 The teapot stands approximately 7 inches tall with the lid and is 5 1/2 inches wide, it holds 8 cups. The cups are 2 1/4 inches tall and 3 1/4 inches in diameter. It is in excellent condition, no cracks or chips. 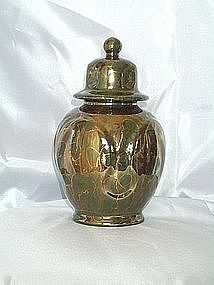 This jade colored ginger jar is accented with a copper colored swirl and gold highlights over the entire jar and lid. The jar is approximately 8 1/2 inches tall and 5 1/2 inches in diameter. I found this in an antique store and fell in love with it. The bottom is marked "PAN" and "93." It is in excellent condition with no chips or cracks.